My review queue on the site toolbar typically has some number. When I got access to my first moderation tool, I thought that this was the number of items in the review queue, but it was never consistent and frequently showed some number even if I had zero items to review. I recently got access to the last moderation tool, and I figured I'd try to take a more active stance in participating in site moderation, but my queue is still reporting a non-zero number. My question: Is there somewhere else I need to be checking for reviewing items, or is this a bug? I've noticed that sometimes the number gets out of step with the current values. If you click on it again, it will often clear. I suspect that this is either a caching issue, a page refresh issue or combination of the two. I myself encountered the same thing on SE Arduino, and asked about this on SE Meta, on Feb 18, see Suggested edits review queue notifier does not update as reviews are completed. However, after just trying to locate the question, so that I could point you towards it, in a comment, it unfortunately appears that my question has been deleted. So I have reproduced it below. As the two links to the previous SE Meta questions in my question show, it seems that it is a known bug, for a few years now, but, unfortunately, it has/will not get fixed. Have you considered placing a bounty on one or both of the questions you linked to here to help draw attention to them? So, for the moment, the solution appears to be, as Mark says, to hit the refresh button. This question is probably a duplicate of Items to review counter on the top bar does not update, but seeing as it has been two years sine it was asked, I wondered if thinking has changed, or the technology used has changed, to make this easier to achieve? So... should the number not (actively) decrease as each review is completed (without having to manually refresh the page), to give an accurate representation of the length of the queue (and to save the sanity of the reviewers)? I know that it is bad form to post two queries in one, but it is sort of related... the issue of The "Suggested Edits" flag does not auto-update is still present, and I have noticed it on Arduino SE. Again it has been two years (almost) since that question was posted, and it was never answered, so... what was the outcome of that issue? I can make this second part a separate question if need be. Not the answer you're looking for? 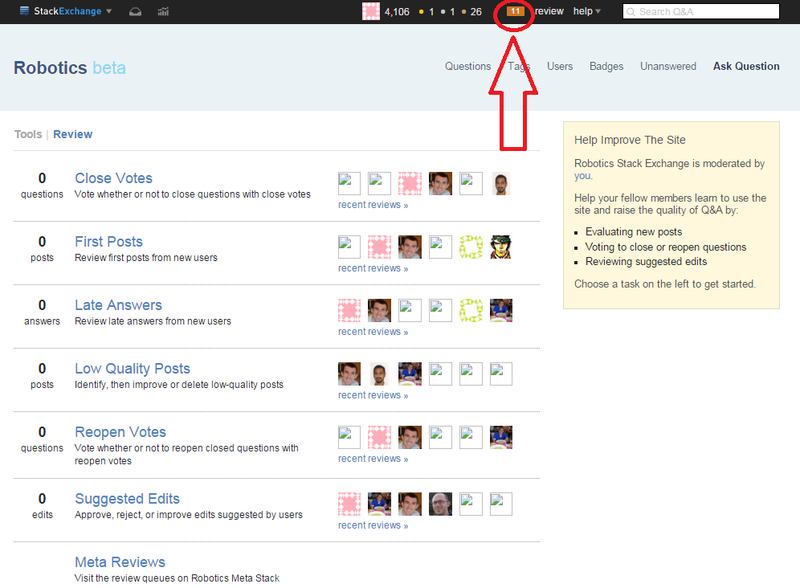 Browse other questions tagged support moderators moderation .